Ralph Goodale says measures in new Liberal legislation are common sense. A rifle owner checks the sight of his rifle at a hunting camp property in rural Ontario, west of Ottawa, on Sept. 15, 2010. A Conservative MP sponsoring an electronic petition claiming that new Liberal legislation "brings back the useless and ineffective long-gun registry" isn't deterred by the fact that the bill does no such thing. "For all intents and purposes, that's exactly what (the bill) does," Tory MP Rachael Harder told HuffPost Canada when asked about the language in the e-petition deriding Bill C-71, which already boasts more than 60,000 signatures. It's a salvo in a firearms debate that seems poised to focus on old grievances as MPs return to the House of Commons next week. Last month, Liberals proposed several changes to tighten the rules on the sale and licensing of guns, something they promised in the 2015 election while also committing not to resurrect the federal long-gun registry killed by the previous Conservative government three years earlier. The registry, deeply unpopular with many in Western Canada and other rural ridings, was dismissed as a "failure" by Justin Trudeau by 2012 despite him having earlier voted to keep it intact. C-71 is being trumpeted by Public Safety Minister Ralph Goodale as legislation that will make Canada safer. It proposes stronger background checks so that the entire life history of firearms licence applicants will be considered, not merely the last five years before the application, to look for past crimes, violence, and mental illness associated with violence. If passed, businesses will be required to keep sales records on firearms and purchasers for at least 20 years, something the government says most vendors already do and was required in Canada from 1979 to 1995. Those records won't be accessible to the government but the police could gain access with the proper authorization, giving officers a tool to track a firearm used in a crime. Individual sellers won't need to keep records. Conservative MP Rachael Harder speaks in the House of Commons on Parliament Hill in Ottawa on Sept.27, 2017. 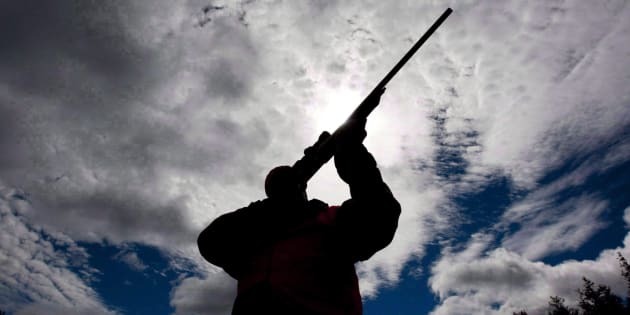 The bill also demands that anyone selling or giving a non-restricted firearm — an ordinary, long-gun hunting rifle or shotgun — first verify with the Registrar of Firearms that a would-be recipient has a valid licence. Liberals say the process will take only a few minutes, either on the phone or through an online portal, and that no information on the gun itself will be shared. Both the seller and buyer will provide their firearm licence numbers. If both check out as valid, a reference number blessing the transfer will be issued and stored in a database. And it is those steps — the verifying of licences by a registrar and the keeping of records by businesses — that has Conservatives crying foul about a "backdoor registry" that will hamper Canadians for whom guns are tools, either in sport or on the farm. Tories are already mining data on the issue by asking Facebook followers to show support for stopping "Trudeau's new long-gun registry." The information provided, including names, email addresses, phone numbers, and postal codes, will feed the party database and no doubt be used to solicit donations or volunteers. The e-petition, which also decries how C-71 will mean more red tape for gun owners and not do enough to tackle gangs as the "true source of firearms violence," was launched by Ryan Slingerland, a 15-year-old constituent of Harder's from Coalhurst, Alberta. Harder said she has no issues with the young man's phrasing of the issue since law-abiding firearms owners will need to go through a registrar and receive a reference number in order to sell their guns. "You have a registrar, you have a system for registry. I think it's safe to call it exactly that, a long-gun registry," she said. She suggests the fact that stores will keep records that could "potentially be shared with the RCMP or the police" further confirms her point. "They are making it mandatory that all inventory and sales be tracked. There's a record of every sale made, from this point forward, once the legislation is passed," Harder said. "What would you like to call that?" Goodale says that assessment is simply not true. "We promised not to create a new federal long-gun registry, and we kept that promise," Goodale told HuffPost in an email. "Bill C-71 is in no way a registry." The public safety minister is quick to reiterate that it is merely the buyer's licence being verified and that "no information on the firearm itself will be shared with the RCMP." It's just good sense for stores to keep records, he said, and that has been the practice in the United States, a considerably more gun-friendly place, for decades. Given Conservative passions on this file — not so long ago Alberta Tory MP Blaine Calkins taunted in the House that Trudeau Liberals could pry his guns from his "cold, dead hands" — it's perhaps surprising that the debate over C-71 has been understated, so far. When Liberals unveiled the bill, Conservatives were seized with pushing for the prime minister's national security adviser Daniel Jean to appear before a Commons committee to answer questions on Trudeau's much-maligned India trip. Some of the time set aside to debate C-71 was then lost to the marathon, all-night vote punishing Liberal intransigence. Tory Leader Andrew Scheer also did not press Liberals on the bill in question period. "When the Liberals are making so many mistakes in the way that they are governing, which one do you choose?" Harder asked by way of an answer for Scheer's silence in the Commons on the matter. Tory public safety critic Pierre Paul-Hus argued in the House that forcing stores to keep records was an "insidious" way of bringing back the registry. "The government can deny it, but clearly, this is about putting everything in place to eventually bring back a registry," Paul-Hus said at the time. And that is a position shared by advocacy group the Canadian Coalition for Firearm Rights (CCFR), which says lawful gun owners are being "gaslighted" by the government. "I acknowledge, 100 per cent, you do not have 100 per cent of a registry," CCFR president Rod Giltaca said. "But you have two-thirds of it." Setting aside what he called more bureaucratic hurdles for people who are already too regulated, Giltaca argues the reference number system for private transfers means the infrastructure for a registry will be quietly rebuilt. The fact that the description of the firearm and its serial number won't be recorded — "that's the one-third that's missing" — is no comfort. "It's a fact that... I want to sell you a firearm. Both of us have to call the firearms centre, we both give our information. That information is recorded, logged, and if they approve the transfer — see they have to approve it even though we're both licensed — then they issue us a reference number for that transaction. That's a registry." Giltaca likens it to someone claiming he doesn't have a car on his property just because the wheels have been removed. In his mind, it all amounts to Liberals trying to score an easy political win through the appearance of tackling gun violence. Liberals are pointing to stats showing a 30 per cent increase in crimes involving guns between 2013 to 2016. "It takes very little effort to go the licensed gun owners and further regulate them, and then say, 'Yes, we've done something,'" Giltaca said. But another firearms enthusiast says its not valid to argue C-71 would bring in a registry, through the backdoor or the front. A.J. Somerset, author of "Arms: The Culture and Credo of the Gun," told HuffPost that the bill was a Liberal exercise in tip-toeing around controversy. Somerset noted that the desire for licences to be validated, even in private gun transfers, was spelled out clearly in the last Liberal platform. "What does the reference number actually point at? It creates a record that a licence was validated," he said. "It doesn't create a record that a firearm changed hands. It has no information about the firearm that may have changed hands as a result." Somerset offers that all those changes might amount to about "10 per cent of a registry," but even that assessment is magnanimous. "Just because they start recording sales tomorrow doesn't do anything about registering seven million guns that are already existing in the country," he said. Somerset said the spectre of a resurrected long-gun registry is a "really good political hammer" because it highlights why the firearms community is reluctant to give Liberals the benefit of the doubt. Tory House Leader Candice Bergen touched on that history in debate last month. "Liberals cannot be trusted when it comes to firearms legislation that would do anything to get firearms out of the hands of criminals while at the same time protecting and respecting law-abiding Canadians," she said. "The Liberals cannot be trusted." Candice Bergen gives a thumbs up as she votes alongside former Tory MP Eve Adams on Bill C-19, a bill to scrap the long-gun registry, in the House of Commons on Feb. 15, 2012. It all traces back to the way a past Liberal government brought in sweeping measures in 1995. "They created a registry and then with their other hand, they passed regulations that banned a half million firearms across the country," Somerset said of the Liberal government of Jean Chretien. "So, they created the impression that they were in fact coming for your guns." And if a federal registry is poison among gun-lovers, it doesn't engender much sympathy among the wider public because the costs to taxpayers, anticipated to be around $2 million in the mid-90s, ballooned to $2 billion. "The irony is they're fighting the bill on something it doesn't do and they're not talking at all about the things that it actually does do," he said. "Some of which the government should be forced to justify." For instance, the bill will ask that owners of restricted firearms — such as most handguns — first get a permit before taking them to gun shows or a gunsmith shop for repair. There are clearly going to be costs and headaches associated with such steps, Somerset says. C-71 will also restore the authority of the RCMP to classify guns and repeal the authority of the federal cabinet to override those decisions. The firearms community has also had trust issues with Mounties, especially after officers in High River, Alta. seized firearms in the wake of floods nearly five years ago in a manner the RCMP watchdog deemed to have crossed the line. On the other side of the debate, some victims' rights groups have said C-71 doesn't go far enough. And it's not as if Liberals haven't played politics with this legislation, as well. On the day the bill was tabled, the Liberal Party sent a fundraising plea accusing Tories of taking their marching orders from "Canada's NRA." Trudeau also faced heat for a tweet stating that it's not currently a "requirement" to show a licence before purchasing a gun, something that firearms enthusiasts blasted as misleading. We're also introducing stronger and more rigorous background checks on gun sales. And if you want to buy a gun, by law you'll have to show a license at the point of purchase. Right now that's not a requirement. "You wouldn't find a single gun shop that would sell you a gun without looking at your licence," Somerset said when asked about Trudeau's tweet. "I think you might find one in 100 people who would do a private sale without seeing your licence. And that's probably a very generous estimate." In the House last month, Goodale painted the picture of a hypothetical exchange between the owner of a small firearms store and a shopper seeking to buy a rifle. The minister asked MPs to imagine that customer has shopped there for years but has lost both his firearms and licence after a domestic violence incident. "Having sold several firearms to the same customer over the years, the sales clerk decides that he knows the customer well enough and does not have to run a check against the licence," Goodale said. "Bill C-71 will ensure that the salesperson is required to make that call." For Harder and other Tory MPs, Trudeau's tweet belied a "frustrating" misunderstanding about Canadians who buy and sell guns. "We're not talking about women and men who are wanting to cause trouble or harm to any other Canadian," she said. "If the government really is interested in serving the Canadian public, they need to go after the criminals who are responsible for violent crime." The remark suggests Canada's gun debate is as much about values as anything else.